Daniel Silva. Orion, London 2001. ISBN 0 75283 702 8. £5.99. ULSTER’S TROUBLES have generated mountains of books, fiction as well as non-fiction. In the fiction category The Marching Season spins a nail-biting tale of international intrigue set in the aftermath of the Good Friday Agreement. The ‘baddies’ are the zealots of the Ulster Freedom Brigade (UFB), a breakaway loyalist group hell-bent on wrecking the GFA by whatever ruthless means they can do so. The chief good guy, is CIA agent Michael Osborne. This hero is not a yes man, for he knows that in the game of espionage, he has as many enemies inside the ‘company’ as he has on the outside. How does a CIA agent end up crossing a bunch of Portadown loyalists? As the plot thickens there are many outside interests who want to keep the Ulster pot stirring. There is a shadowy international society of intelligence chiefs and arms merchants who continue to plot to intensify conflicts the globe over. In their view “peace is bad for business”; their business that is! The trouble is that the GFA has set a dangerous precedent in that “peace” deals are emerging in many other places. Hence, the UFB receives covert assistance. In the final chapters, the UFB’s most fanatical member, a lovely lady named Rebecca is teamed up with one of the society’s operatives, an ex-KGB assassin now working for hire. (Interesting that in other novels and films on the ‘troubles’, like the Crying Game and Patriot Games, where dissident republicans are the baddies, the strongest fanatic was also a woman!) Their mission is to kill the U.S. Ambassador to the U.K., a former New York Democrat Senator who is heavily involved in keeping the GFA afloat. It also so happens that the ambassador is also Michael Osborne’s father-in-law! In the end Michael thwarts the assassination attempts, and exposes the working of the shadowy society. Thus, the goodies win, the baddies lose, but lovely Rebecca escapes and goes into hiding. 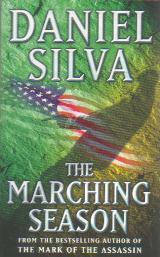 As a thriller trying to “out Clancy” Tom Clancy, The Marching Season has its merits and demerits. (It does bear some similarities to Clancy’s Patriot Games.) It is a light read, and would definitely satisfy the reading appetite of any espionage buff on the plane, bus and train. The novel does contain both plausibilities and implausibilities. For an American Silva has done a better job than most of his countrymen in getting Ulster’s geography and social milieu right. Certainly if a dangerous dissident loyalist group did emerge, it would more than likely come from Portadown. Yet, it has been the dissident republicans, not the loyalists, who have done the most to violently threaten the GFA, as shown by the Omagh bomb. On the other hand, the loyalists have devoted more energy in their violent feuds with each other, as was shown in August, 2000. There does seem to be a lesson to be gleaned from this down market yarn. Failure to truly resolve Ulster’s deadlock with a real meaningful solution for both communities, will invite intervention by outside parties, and probably those having an interest to keep the conflict alive. The shadowy society of Silva’s creation is probably a larger than life example of those kind of forces.